How many of us visit the pumpkin patch every year? I know Mary and I do! It's a yearly tradition and we just love it! I think this year we'll end up doing it a few times! 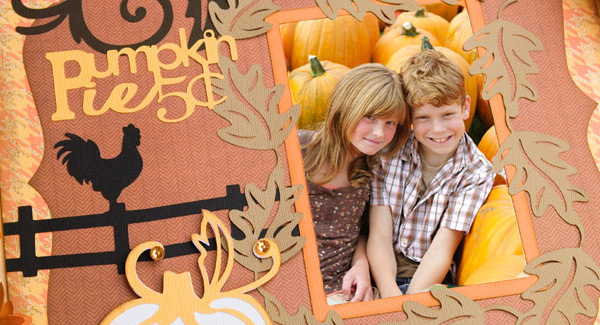 If you want to, tell us which pumpkin patch you visit every year! Tell us the name and the city using the comments section! Anyways... we hope you enjoy making this fun layout! I know Mary had fun creating it and I was like WOW when I saw it! The photo in our layout is a 4x6 photo. The frame of leaves cannot be cut on the 12x6 mat as pictured, but can be shrunk down to 5.5"w x 6.6"h to fit on the 12x6 mat and still work in the layout. The large background scalloped shape cannot be cut on the 12x6 mat. All of the SVG files and their dimensions are listed in the table below! If you have any questions or comments, feel free to contact us using this link! Have fun and happy crafting! 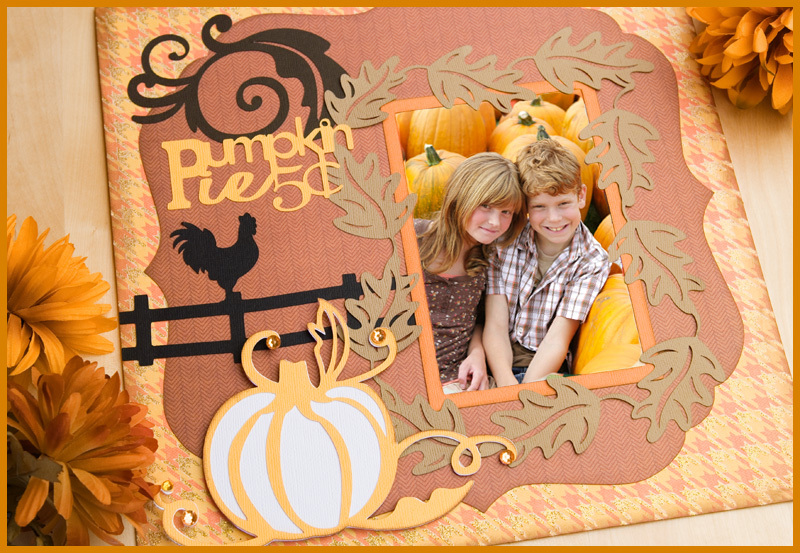 Ink the edges of the 12x12 paper, the large scalloped shape, the pumpkin and the orange photo frame with dark brown ink. This adds a nice touch! Oh this is gorgeous!! and the new set is FAB!! I love the Fall designs. Such a great variety. They will work so nice with my Fall Foliage pages and Thanksgiving cards. I’m just learning to add flourishes to my pages and that leaf flourish is just beautiful. Great work. My favorite pumpkin patch is in Almont, MI; however, my favorite pumpkin patch story actually took place at the local cider mill and pumpkin patch right down the road from my house! (Lapeer, MI). I volunteer with Young Marines, and we have kids in the unit between 8 and 17 years old: one year I took a handful of them to the cider mill, and they were able to take a wagon ride to the back of the property where the pumpkin patch is. Unfortunately, we had a wet, cold year then and most of the pumpkins were molded or rotten, so the good ones were already picked and put in piles throughout the patch (not quite what we had in mind for picking our own, but the kids didn’t even flinch about it!). When the tractor stopped, all of the kids jumped down and scattered: the only the direction the farmer gave was that they had to take pumpkins that they could carry themselves. One of the smallest boys I had with me that day was ten. And the eldest boy was fourteen (he was a large football-type kid, and had been in some trouble before joining our unit. This was a first non0meeting experience with him, so I was unsure of what to expect from him). Anyhow, the ten year old boy poked around from pile to pile for what seemed like forever. Eventually, everyone except for him had hauled their prize pumpkin back to the wagon. He could be seen picking through a pile, but he was on the opposite side, so we couldn’t be sure what the hold up was. It seems he had chosen this monster-sized pumpkin, probably the biggest one in the pile, and he was determined to pick that sucker up, no matter what! The determination on his face was evident, and the eldest boy saw him struggling. The eldest jumped off the wagon, jogged over to the younger child, picked up the pumpkin on his shoulder, and carried it back to the wagon for him: It was such a heart-warming moment! I will never forget the joy on that ten-year-olds face when I dropped him off at home to his mom – he ran screaming from the vehicle, “Mommy! Mommy! Wait until you see the giantest pumpkin I got that Adam carried for me!” It was great!